FarmVille recently releases the new building the Bloom Garden which can hold the new group of flowers called the “Blooms”. These group of flowers are different from the current group of flowers crops. They are a limited edition that can also be mastered. 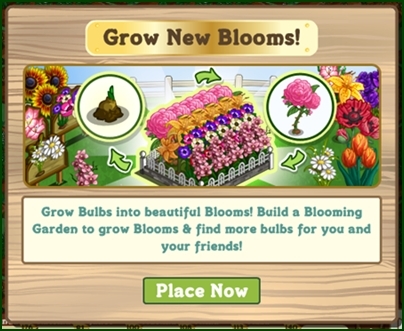 The Bloom Garden can also be upgraded up to 3 stages and each stage will increase the number of blooms it can hold. 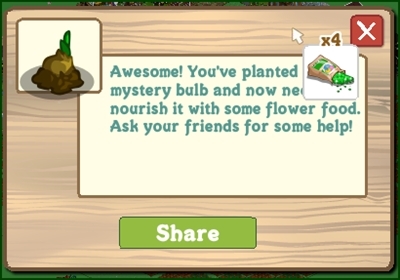 Once entering the game, a popup dialog will inform you about this new feature then you’ll be ask to plant a seed and place the building. Collect the necessary parts to finish it. Initially it will need Flower Tie x10, Gardening Edging x10 and Trellis x10. You can either buy the parts with your FV cash, ask friends for parts or click on friends feeds. 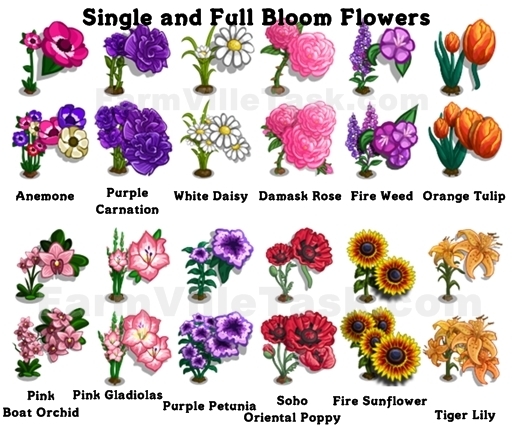 The Single Blooms – full grown flowers that is in Single Stemmed Flower. Takes several days to grow and will wither if not harvested within seven days but will not wither if it placed inside the Bloom Garden. The Full Blooms – full grown flowers that grows in Bunch of Flowers. Gives double mastery when harvested and never withers. Harvesting these Blooms will produced “Mystery Bulb” which can grown into a Single Bloom Flower. To grow them you’ll need to feed them with Flower Food. 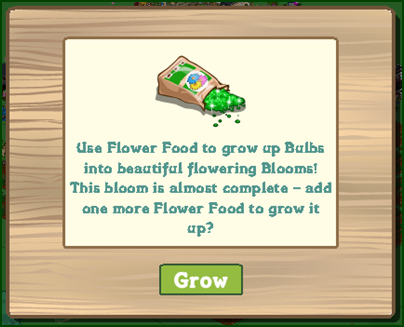 It will require 5 Flower Food to make them grow. 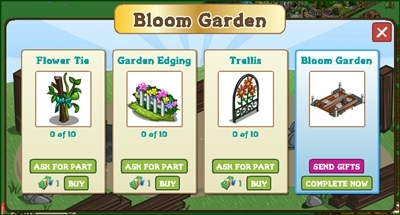 You can check out the market for available Flowers to place in your newly built Bloom garden. The letter “S” means Single Blooms and the “F” is Full Blooms. Good Grief! What next? 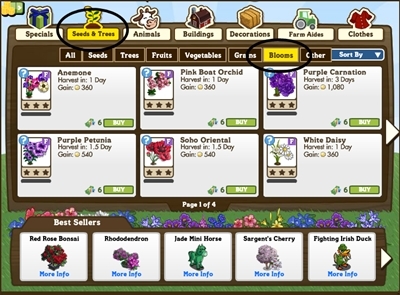 Impossible now to collect all the items needed to complete the buildings, aquariums, paddocks, etc…just what we need something else to collect items to complete. Would me very nice if Zynga would give us a little help in collecting the items we need. Special delivery boxes don’t help with many of the items that are difficult to collect. Especially, when you can’t post help request or/and can’t accept the gifts because Zynga can’t get there act together to fix what is not working…Oh, but …”let’s start something new”!!! Gives us a break, Zynga. FIX what you’ve got! 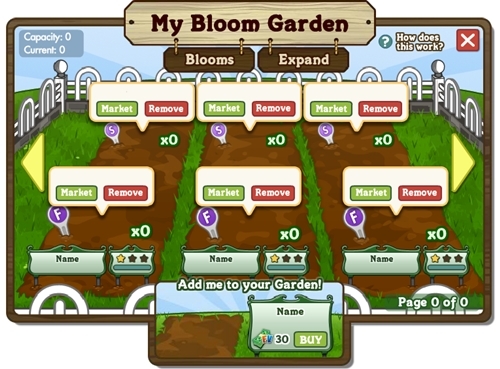 Quite like the new Bloom Gardens.What we need now is a Bloom Mastery Board,otherwise they’ll just gather dust in the Gift Box.